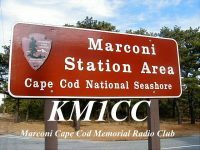 FCC licensed radio operators are invited to operate with KM1CC at the Coast Guard Station, Coast Guard Beach, Eastham to celebrate International Marconi Day. International Marconi Day honors the birthday of the “Wizard of Wireless,” Guglielmo Marconi, on the Saturday closest to his birth date, April 25, 1874. The public is invited to observe operations from10 am- 3 pm; operators are needed from Friday April 21 at 8 pm ET through Saturday April 22 8 pm ET. For more information contact Barbara Dougan, KB1GSO at Barbara_Dougan@nps.gov . For park information, and maps visit: http://www.nps.gov/caco. CW and voice operations: local 2 Meter repeaters, 17 Meter, 20 Meter, 40 Meters, and 80 Meters. Marconi’s South Wellfleet Station site is located in Cape Cod National Seashore and is open to the public. The station was built on a coastal bluff in 1901. Due to erosion, little remains of the original site. However, a model and a few remnants of the tower bases can still be seen. Cape Cod National Seashore has a free Marconi: Beyond the Horizon lesson plan on its website: http://www.nps.gov/caco/education/lessonplans.html. This lesson plan includes activities that meet Massachusetts’ history, physical science, and technology/engineering learning standards. For more information about historic Marconi Stations around the world and International Marconi Day visit: http://www.gb4imd.co.uk/.